[142 Pages Report] The audience analytics market size was valued at USD 3.25 billion in 2017 and is projected to reach USD 6.30 billion by 2023, at a Compound Annual Growth Rate (CAGR) of 11.8% during the forecast period. The base year considered for this study is 2017 and the forecast period is 2018–2023. With the increasing engagement on digital platform and growing efforts for the development of smart cities, the demand for audience analytics solutions and services among enterprises is expected to grow significantly. The audience analytics ecosystem comprises service providers, such comScore (US), Adobe (US), Oracle (US), IBM (US), Google (US), Unifi Software (US), SAS (US), Akamai (US), Cxense (Norway), NetBase Solutions (US), Cadreon (US), Socialbakers (Czech Republic), Crimson Hexagon (US), Quividi (France), 3DiVi (US), Flytxt (Netherlands), Telmar (US), StoryFit (US), Brandchats (Spain), Verto Analytics (US), AnalyticOwl (US), Verimatrix (US), Brandwatch (UK), Sightcorp (Netherlands) and Lotame Solutions (US). The other stakeholders of the audience analytics market include Cloud Service Providers (CSPs), government agencies, Independent Software Vendors (ISVs), consulting firms, system integrators, and Managed Service Providers (MSPs). 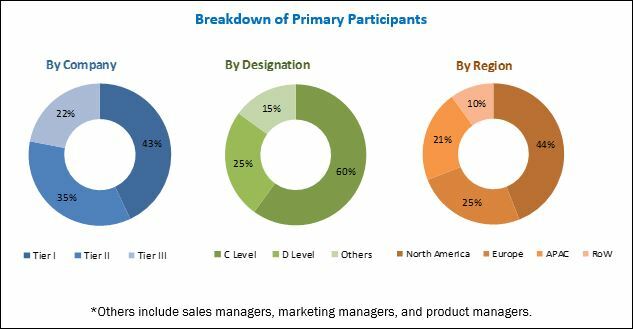 The audience analytics market size is expected to grow from USD 3.61 billion in 2018 to USD 6.30 billion by 2023, at a Compound Annual Growth Rate (CAGR) of 11.8% during the forecast period. The demand for audience analytics solution and services is expected to be driven by several factors, such as the increasing user engagement on the digital platform, the growing focus on the competitive intelligence, and the rising need to improve the audience experience. The audience analytics market has been segmented on the basis of component, application, organization size, vertical, and region. The services segment is expected to grow at a higher CAGR during the forecast period, and the solution segment is estimated to hold a larger market size in 2018 in the market. The adoption of audience analytics software and services among enterprises has become a central part of the business process, due to the ease of the use and the flexibility they offer and is expected to show high growth in the coming years. The SMEs segment is expected to be the faster-growing segment in the audience analytics market, as SMEs are increasingly adopting advanced analytics solutions to improve the business performance and enhance the productivity. On the contrary, the large enterprises segment is expected to have a larger market size in the market, due to the high budget and the acceptance of the emerging technologies. Enhanced reliability, scalability, and mobility; reduced risks; and improved production are expected to be the major driving factors favoring the adoption of audience analytics solutions and services among SMEs. North America is expected to witness the highest adoption of audience analytics solutions and services, due to the presence of large enterprises, better technical expertise, and the implementation of the latest technologies. Europe is gradually advancing toward adopting audience analytics offerings to process data at a rapid pace and drive quick business insights. 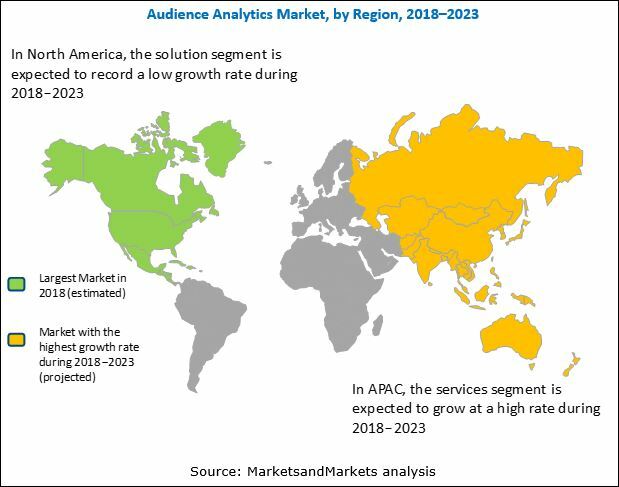 APAC, MEA, and Latin America are expected to record significant growth rates in the audience analytics market, as several large enterprises are expected to utilize the significant growth opportunities to expand their market in these regions. SMEs in these regions have also realized benefits of analytics and are shifting toward the adoption of audience analytics solutions and services, to enhance the business results and improve their efficiency and productivity. The major players in the audience analytics market include comScore (US), Adobe (US), Oracle (US), IBM (US), Google (US), Unifi Software (US), SAS (US), Akamai (US), Cxense (Norway), NetBase Solutions (US), Cadreon (US), Socialbakers (Czech Republic), Crimson Hexagon (US), Quividi (France), 3DiVi (US), Flytxt (Netherlands), Telmar (US), StoryFit (US), Brandchats (Spain), Verto Analytics (US), AnalyticsOwl (US), Verimatrix (US), Brandwatch (UK), Sightcorp (Netherlands), and Lotame Solutions (US). These players have adopted various growth strategies, such as expansions, acquisitions, partnerships, collaborations, and new product launches. The key strategy often adopted by these players is new product launches to achieve a strong foothold in the market.